I love the Amish. Why do I love the Amish? Because everything about them screams of sustainability and self-preservation! There is much to learn from these amazing folks, so here’s “6 Secrets About the Amish that You NEED to Know”! I discovered the Amish about 25 years ago, when we were trying to get out of debt and get our finances in order. If you aren’t familiar with the Amish, they are a fascinating group of people who escaped religious persecution in Switzerland and Germany to migrate to the United States in the early 18th century. They initially settled in Pennsylvania, although other waves of immigrants became established in New York, Illinois, Indiana, Iowa, Missouri and in Holmes County, Ohio. Holmes County is home to the second largest sect of Amish in the nation. They are often referred to as “simple” people who all dress and wear their hair pretty much the same according to their church “order”. They are a very hardworking population and largely take care of themselves and their elderly, as they opt out of social security benefits. Two or three generations often live on one homestead so that grandparents can help with the children as the parents are working in the fields or otherwise. Most of the homes are very large, to allow for large and extended family. While there are a few exceptions, for the most part there is little variance in the design and construction of their homes. 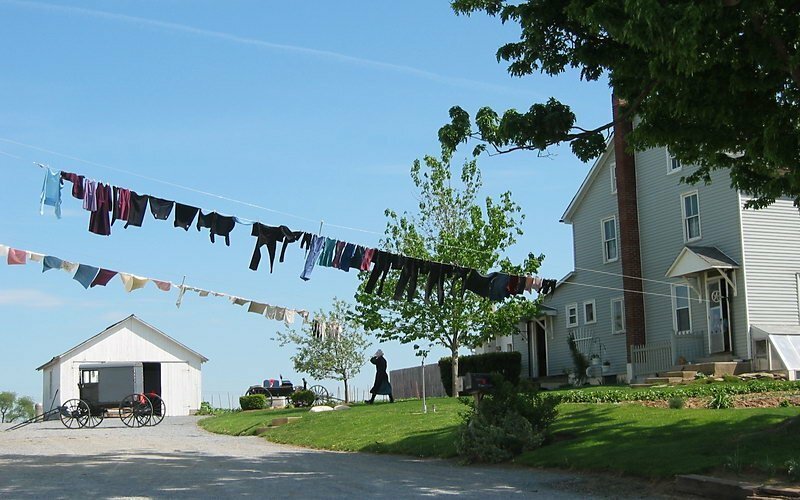 If you spend any time in an Amish community, you will quickly see the similarities of their homes and yards. Every single home has a clothes line, with clothes hanging out to dry very early in the morning. Every home has a large vegetable garden, grape arbor and flower garden. “Order” would be the word I would use to describe an Amish home. Everything is in it’s place and certain “must haves” don’t seem to be optional. Our family has visited “Amish Country” here in Ohio many, many times over the years, and I always learn something new. During our trips, I’ve gone to every field trip I could find, asked a lot of questions and bought every book I could get my hands on about the Amish. Some of my favorite Amish destinations were the ones that allowed a tour through the “Old Order” homes and the “New Order” homes to compare the differences. If you are into sustainability, the Amish are the masters! Like many persecuted sects in history, the Amish have found ways to provide for themselves within their community. They trade and barter, however, they also do some business with the “English”, those who are non-Amish. It’s been a while since farming was the Amish’s main source of income, and so they’re turned to tourism. When you visit Holmes county, there are fabulous bed and breakfasts as well as gorgeous cabins to stay in, but be prepared to make reservations far in advance, the bests places are sometimes booked a year out. This is because Amish country is very popular during the fall and many try to visit during “peak color” seasons. 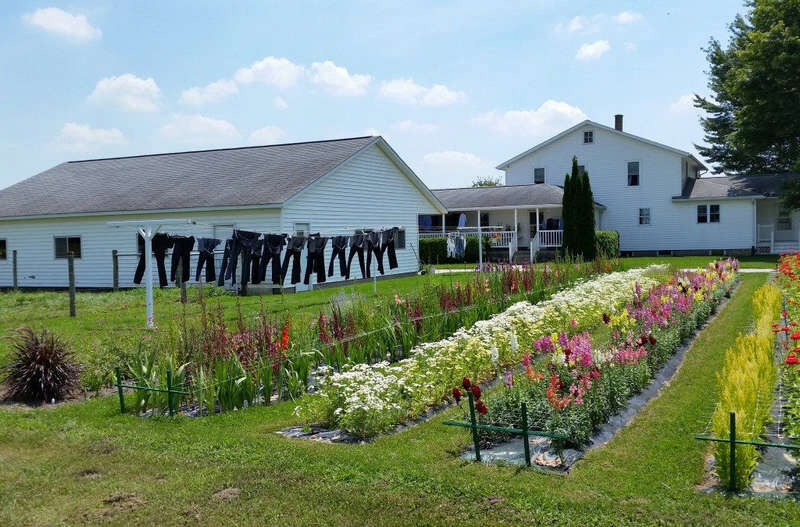 Up and down the main arteries of Berlin and Millersburg, Ohio, you will see Amish restaurants, bed and breakfasts, craft/souvenir and quilt shops everywhere. You will also see tons of roadside stands! Many of the businesses are either Amish-owned or Amish-run, and much of what is sold is also Amish-made. Whenever you enter an Amish business, you’ll likely see bakery items being offered. The Amish are incredible bakers! The Amish are particularly known for their craftsmanship, especially with wood. Again, there are shops everywhere offering Amish-made rocking chairs and furniture. Our family purchased a custom, Amish-made dining room set about 8 years ago, for our large family. It wasn’t cheap, but it’s an heirloom that will stay in our family for many generations to come. Amish country has wonderful bulk food stores, where I often stock up big-time! I’ll buy #50-100 of wheat berries at time, as well as sugar and other non-perishables that are so reasonably priced there! You know the prices are good when you see other Amish ladies shopping there as well! The point that I’m trying to make is that the Amish have created a niche for themselves and make an excellent living in and for their community. They desire autonomy to practice their religion the way they choose and secure it by taking care of themselves financially. Many cultures do this, and sadly I think it’s something that we’ve largely forgotten in this country. In the last 50 years or so, manufacturing plants and corporations have moved all over the nation, taking jobs with them. People rarely work where they grew up, most of us are transplants from somewhere else. As a result, families are separated and unable to help each other. If you dig a little deeper into it, you’ll realize that this separation of family actually contributes to massive consumerism, because needs like child care and homemaking that could be available from extended family members now must be outsourced and purchased. Not to mention the fact that each family has to sustain an entirely separate household, instead of sharing expenses within one household. The Amish place tremendous value on their elderly, as well we all should. The older generation brings wisdom in terms of skills, business, farming and raising the next generation. Working through differences and embracing their heritage keeps the family unit strong and effective. The Amish build their own homes in order to maintain their sustainable lifestyles. Kitchens are large in order to keep up with cooking and preserving food for growing families. Bedrooms are small and primarily for sleeping. Gardens are a critical part of the family’s menu and is close to the house. Children are taught to work the garden at a young age. Again, clotheslines are close to the house as they are an important part of home keeping. Predictability and consistency would be words I would use to describe an Amish home. There isn’t any sort of personal style that is incorporated into their homes, that isn’t something that the Amish embrace. All is done for the good of their faith and community. The Amish believe that those wires carrying electricity bring sin into their homes and they do not allow it. Now, don’t misunderstand, because some do use gas motors and other forms of power, depending upon what order they are part of. Some are allowed to use telephones off of their property. But by and large, the Amish live “off grid” and are very good at it. Cheese is one of the Amish’s most popular products, and if you visit, you’ll see a lot cheese stores. The reason for an abundance of Amish cheese is due to the fact that without refrigeration, milk spoils and something must be made of it! Cheese is the answer! The quality of their cheese is unmatched, partly because of the quality of the milk being used for the cheese. Most Amish farmers do not use pesticides or chemicals (although most not certified organic) and so the cows graze on healthy, chemical-free grass. Amish cheesemakers also use time-honored methods and don’t rush the process. Gussisberg Cheese, one of the larger cheese shops, has large windows so that you can watch cheese being made, it’s pretty cool. If you’re wondering where the Amish shop, Lehman’s is a “non-electric” store that was founded in Holmes County. There you will find all types of oil lamps, candles, wood stoves, books, water pumps and a zillion ways to maintain an “off grid” lifestyle. We’ve been there and it’s one amazing place! The pressure we feel to stay in a job or career that we hate is due to bills, right? Well, again the Amish are masters at keeping their overhead at a minimum. They build their own homes, using labor from not only family, but also community. Building supplies are likely secured through intimate ties within the community, and through bartering. This alone eliminates a mortgage and electricity payment. The Amish do not carry insurance of any kind, that I’m aware of, eliminating another bill. They grow their own food, they make their own clothes and they provide their own entertainment. Of course the Amish use money and purchase things, but as you can see, their overhead is much lower than the average American. 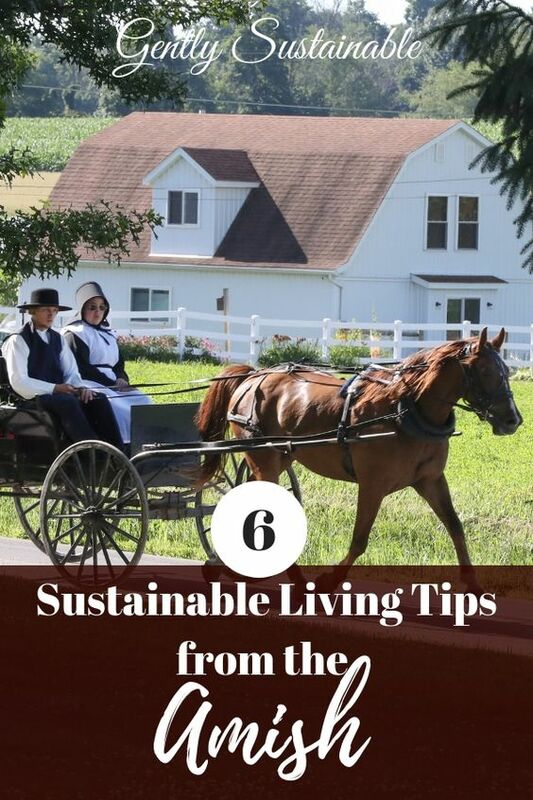 If you are truly interested in the sustainable lifestyle, you need to check out an Amish community. I have never regretted the time I’ve spent up there. Again, fall is a gorgeous time to visit and I recommend staying a whole weekend. Go to the attractions, ask questions and definitely visit Lehman’s. You’ll be more sustainable just for having been there! Thanks for the kind words about the Amish. My Amish relatives are in a smaller community in Yoder, Kansas. This was really interesting to read. I live in southwest Missouri and we have an Amish community in our area. We had a new metal roof put on our house last year and it was done by an Amish family. Young men scampered around our steeply-pitched roof like mountain goats, and a young man of about 13 drove the sky-lift like a pro, even carefully maneuvering around my fruits trees. They were supervised by their grandfather. It was really neat to watch them work together and they did a great job for us. Hi Michelle! Did you know that the Amish finish school in 8th grade and go on an apprenticeship with their father or another relative? They learn very early to take care of themselves and the family by working. An Amish man built a building for us after he chicken-scratched the plans out on a crumbled piece of paper! That building is better built than my home! 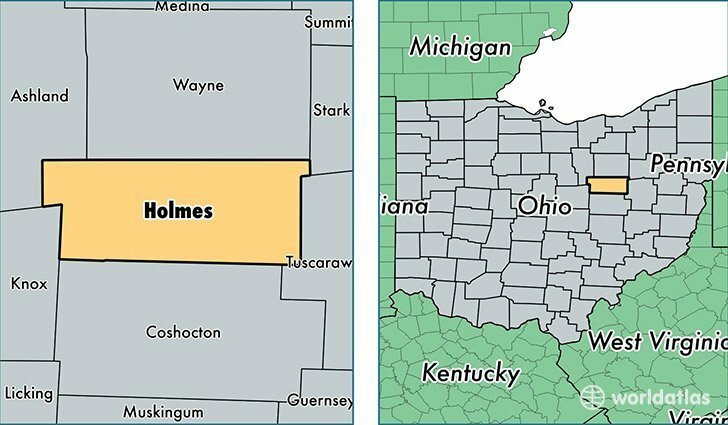 I live in WV but have visited Holmes County many times. I love it! We always try to go for a couple of days in the middle of the week as most things shut down for the weekend at 5pm on Fri. Lehmans is well worth the drive to the next county and for anyone who is interested,they have a great mail order catalog. Thanks for mentioning that they close down for weekends, I completely forgot about that! Have you ever visited the Amish community in Lancaster, PA? I hope to get there one of these days.